Nancy Duarte of Silicon Valley presentation fame has a video here discussing how to effectively present webinars. IBM has made a stop motion animation by moving individual molecules. Ars Technica has an article about it here. A 9 year old boy's imagination runs wild. Caine's Arcade from Nirvan Mullick. The website for this and a worldwide project is here. The project goes from September until October 5th. Their goal this year is to engage 1 Million Kids in 70 Countries in Creative Play. Bret Victor - Inventing on Principle from CUSEC. This is an inspirational video. There are many good ideas and demonstrations in this video. At around 29:25, Bret shows the creation of an animation sequence both with Flash and an iPad app that shows some remarkable insights into a possible animation UI. Bret's personal site is here. As seen in a Mashable article here, the Japanese Ministry of Defense has invented a spherical flying machine. It is a beatiful concept. 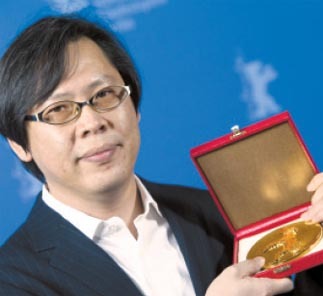 From the Korea JoongAng Daily in association with the International Herald Tribune here comes an article about Korean film director Park Chan-wook who just won best short film in the Berlin International Film Festival for his 25 minute film "Night Fishing" which was shot on an iPhone. The film's $136,363 budget was funded by KT, the exclusive iPhone service provider for Korea. Kodak stopped making Kodachrome film last year. The last facility to process the film in the world will process the last roll today because they have run out of the chemicals. I would not know about this story except for a tweet by David Pogue here. This was the film that recorded many moments of my family's life growing up. My father shot Kodachrome slides mostly with a Kodak 35mm camera and we spent many evenings looking at them being projected in a darkened room. He used Kodachrome all of his adult life. With my father's great skill at correctly guessing exposures it captured many fond memories. His camera did not have a light meter. He used his eye and many years of experience. In 2007 Hans Rosling appeared at TED and showed an amazing display of stats that were actually interesting. That video is here. Below is another, more beautiful example of a similar idea with higher production values. The video is from a BBC show called "The Joy of Stats." He has an exhibit of his iPad work at the Pierre Berge-Yves St. Laurent Foundation in Paris. Gruber points here to a wonderful video by Jarrett Heather here that shows a mastery of kinetic typography. According to Heather's post, he used After Effects, Toon Boom Animate, Illustrator, Photoshop and Premiere to achieve this slick video. Shop Vac from Jarrett Heather. As the GoogleTV team noted, "Google TV made it on Fox's Holiday Gift Guide: Best Gadgets for Families list!" This was linked to here. The irony is that Fox.com blocks GoogleTV as reported here.
. It has 10 40" touchscreens, each run by a 27" iMac. I've used Quartz Composer to create simple graphic composites but I've never seen anything like this. Quartz Composer 10m Installation from Rob Reid on Vimeo. Bruce Schneier here pointed to an item on Wired here about a microphone system that can pick out individual voices in a crowd. The audio technology is available from a company called Squarehead here. From Bruce Sharpe here comes a link to an article on cnet here about HDR video. Soviet Montage Productions of San Francisco has found a way to combine video from two Canon 5D mark II's, one over exposed and one under exposed into HDR video. While we wait for true HDR imagers, maybe someone will rediscover the techniques used by Technicolor for film and older video cameras of using a prism to split an image to 3 imagers with different settings or simply use neutral density filters. Video with dynamic range that exceeds the human eye can't be far off. 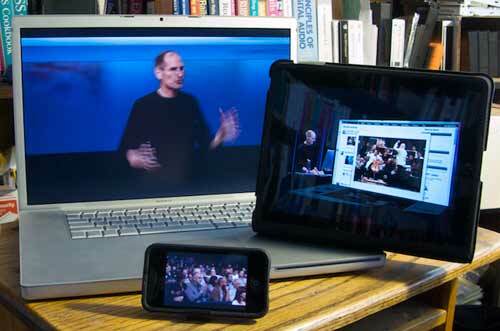 For the first time in a long time today's Apple special event was streamed live. Above is a photo of 3 devices playing the "live" feed. As you can see, they are showing 3 different images. That's because Apple's HTTP streaming technology does not guarantee simultaneous delivery of content, only the high likelihood that it will get there soon. Soon in this case seemed to be a delay of about 30 seconds from live for the first device (usually the iPhone for no apparent reason) and the others trailing at a random interval of up to maybe another 30 seconds. iOS 4.1 (next week) - bug fixes, High Dynamic Range photos!! The full capabilities of AirPlay are unclear to me just yet, but one thing it will allow you to do is stream content from your iPad to your AppleTV. The presentation was cool. There are a lot of details that I don't understand yet. It will be interesting to see how they pan out.